Tripp Lite's SR12UB premium SmartRack 12U Enclosure Cabinet is packed with features designed to simplify rack equipment installations and rack equipment maintenance. The SR12UB ships fully assembled for quick installation and comes with a 5-year warranty. 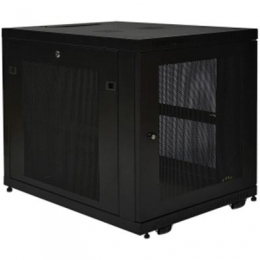 The SR12UB is compatible with all standard 19-inch rack equipment and features front and rear pairs of vertical rails with square mounting holes. The rails are adjustable in quarter-inch increments to accommodate equipment depths from 3 to 32.5 inches, ideal for standard server installation. The rails feature square mounting holes and are capable of supporting up to 250 lbs of equipment with included installation hardware. Each rack space within the enclosure is numbered for easy reference. With a locking, reversible front door and locking, removable side panels, the SR12UB provides safe, secure installation for all equipment. The enclosure meets all requirements toward PCI DSS compliance.